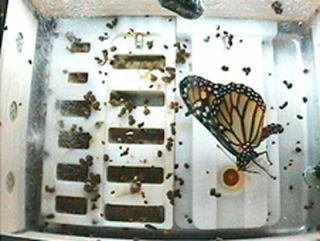 After completing its pupa stage, a Monarch butterfly emerges on the International Space Station on Nov. 30, 2009 during the latest in a series of educational experiments designed to accompany in-class experiments for teachers and students. Thefirst-ever Monarch butterflies in space have taken flight on the International SpaceStation to the delight of astronauts aboard. Spacestation commander Jeff Williams, of NASA, beamed video of the first of severalMonarch butterflies fluttered its gossamer wings in weightlessness last week,just after the insect emerged from its cocoon and began floating around theirenclosure. ?It isbeautiful,? Williams radioed Mission Control. ?It?s always beautiful to see alittle bit of Earth up here.? The videoshowed one adult Monarch butterfly floating gently in microgravity as it openedand closed its wings to dry them. ?Congratulationsto the experiment team,? Williams said. ?They arevery proud parents,? Mission Control radioed back. ?Glad you finally got the video.It?s a pretty awesome site.? The Monarchbutterflies are the first ever sent to space. They began emerging just daysafter several Painted Lady butterflies began emerging from their own cocoons ina separate enclosure. The Monarchand Painted Lady butterflies arrived at the station as catepillars last month on the spaceshuttle Atlantis as part of an educational experiment. And while butterflylarvae have been sent to space before, the colorful insects on the spacestation now are the first to successfully go through all phases of theirdevelopment ? from larva to pupa to adult butterfly ? in orbit. More than 170,000students between kindergarten and 12th grade and 2,800 teachers are followingthe experiment on Earth, where they are comparing the space butterflies?lifecycle with that of similar insects on the ground. The butterflies also havetheir own Twitter page ?ButterflySpace? where status updates of their spacemission appear. At leastone difference between space Monarch butterflies and their terrestrialcounterparts has already been revealed. On Earth, the wings of a newly-emergedMonarch butterfly can take anywhere between three and five minutes to dry. Butaboard the space station, it took about 15 minutes.? The Monarchand Painted Butterflies were delivered to the space station inside a habitatknown as the Commercial Generic Bioprocessing Apparatus Science Insert ? 03. Itwas built by BioServe Space Technologies at the University of Colorado atBoulder. Because ofthe cramped quarters, the Monarch butterflies ? which began emerging Nov. 30 ? wereonly expected to live about four days, instead of the two weeks they wouldsurvive on Earth, NASA officials said. The space Painted Lady butterflies,meanwhile, are expected to live about a week, about half what they would onEarth. Thebutterflies are not the first critters to live among the human crew of theInternational Space Station. Two orb weaving spiders managed to spinwild webs in weightlessness last year, with astronauts checking in on themfrom time to time.